Originally inspired by instrument panels in vintage cockpits, the BR series has been well received as an iconic member of the pantheon of watches inspired by the past. Experimenting with various materials like ceramic, titanium, forged carbon and precious metals, the softened square design has proved remarkably adept at re inventing itself. More often than not these new reveals cultivated a feel of power and speed with a direct relationship to motorsports in one form or another. As well as the BR series adapted to these contemporary materials and designs, it’s truly remarkable that this canvas has adapted so perfectly to a throwback look accented with Rosewood. The warmth of the wood is combined with either bronze in the time only and chronograph versions, or rose gold in the venerable tourbillon. These particular variations speak to a maritime heritage without shouting, and simultaneously highlight the uncanny adaptability of the basic frame. Each edition will be released on a limited basis with 500 of the time only, 99 of the chronograph and 20 tourbillons to be offered. 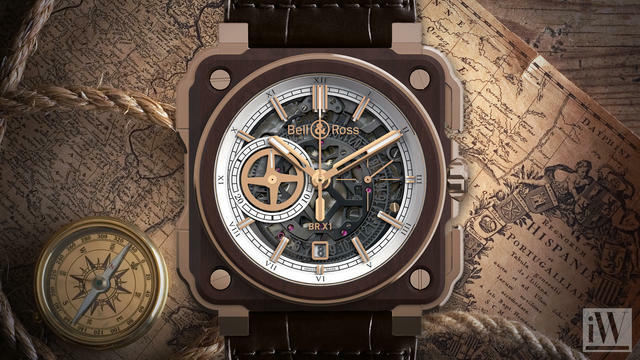 Bell & Ross’ passion lies in military history and values. Its quest to provide precision, unique timepieces to both professional pilots and watch enthusiasts have sky-rocketed the brand into one of the most recognized in the world. Many Bell & Ross timepieces emulate aeronautical instruments, both found on the dash of the most technically sophisticated birds and vintage air crafts alike.